If Kate Jacobs has learned one thing, it’s patience. Her latest release, Home Game (Small Pond Records), is her fifth full-length and comes seven years after her previous effort, 2004’s You Call That Dark. In that span she’s taken time off from recording and touring to raise a family while continuing to write the same vividly drawn narratives within perfect pop melodies that she’s been writing for years. On Home Game Jacobs reflects on “life among backpacks and lunches (who ever thought about LUNCH so much),” marriage, divorce, children, Ireland, the internet and the park. We spoke with the singer-songwriter from her home in Hoboken, NJ. It’s not easy being a Mets fan here in Braves country (I’m in Atlanta) so I was delighted by the opening track, “Rey Ordonez,” on Home Game. There’s something nostalgic in your reflections on the image of the band driving through the night while listening to a game on the radio, and a magical quality in your singing of the lineup. How did this song materialize? I never paid much attention to baseball until 1986 when the Mets won the World Series. That was a spirit to catch on to! I was temping downtown and I remember hanging out the window of some drab bank, watching the thrilling ticker tape parade. A few years later I started recording and touring with a band that included life-long Mets fans, and I started to truly understand the nature of sports fandom. We were often driving late at night in a rented van, chasing down Mets games on the radio. It was so quiet and contemplative, with the occasional, “And it’s outta here!” and the dim roar at Shea. Most beautiful was the litany of Latin names: Jose Viscaino, Carlos Baerga, Rey Ordonez etc. The names suggested the song, but the spirit of the song is the spirit of a band on the road. “On My Monitor” is a tough song to listen to (especially for someone with daughters) if you pay attention to the lyrics under the lilting bossa nova melody. The line where you finally drag her off the screen while her abductor drags her by the wrist is a starkly brutal image. What was it about this tragic girl that compelled you to write this song? Was it a difficult song to write? The song came from an image that popped up on the dread AOL sign in page — those horrible bits of news and images that you don’t want but can’t avoid. (This was back in the day when most people had AOL.) It was a horrifying picture, taken by a security camera at a gas station in the moment a girl was being abducted. It was incredible to me that they would post that image. I couldn’t forget it. She was a beautiful girl and all the adjectives to describe her, “tall, slim, lovely” suggested “The Girl From Ipanema” to me, which is where the bossa nova came from. I’ve never written about violence before, but I couldn’t shake it. The liner notes for Home Game include a list of songs and albums that were played in your house growing up. Was there always music playing? What was childhood like for you? I included that list because as time goes along those early records pop into my head and my writing more and more. We didn’t have a lot of records, just an old cabinet with a couple of shelves of random LPs — jazz, folk, opera, ballet scores, musicals. My parents sang around the house a lot, but they didn’t play records much. Me and my sisters did. When my brother started buying rock and roll albums we had those too. My two sisters and I never bought albums for some reason, but we played everything that was in the cupboard. Your lyrics feature some very inventive wordplay and a heightened sense of the sublime in the everyday. Any songwriting routines? Anything you obsess about? My influences are on the one hand the great, meticulous Songbook writers: Irving Berlin, Cole Porter, Lorenz Hart, Johnny Mercer, Sammy Kahn etc. ; and on the other hand classic country songs with sturdy stories and images and language. There were no country albums in the cupboard, but I found them on my own later. I am very attached to rhyme, meter and form, including divergences. As for the sublime, maybe it’s attention to plants and birds, houses, families, farms and neighbors. I write about close, domestic, knowable things. I make up songs while I’m walking around town. Then I come home and scribble words on a legal pad, and I’ll pick up my guitar and start fumbling for some chords or sit at the piano and plink out a melody idea. “$55 Hotel” is one of the most hilarious adultery kiss-off songs ever. Is this pretty much the way you overheard the story in the park? The title track is about the relief of having a child after a long wait, and learning patience after the child is here, “watching the pot while the water boils.” Having children certainly does teach (and try) our patience sometimes, but did it change your songwriting in any way? I tend to write about what is at hand, so being at home with a family changed my subject matter. Also, it seemed I was always racing before I had kids. Racing to record and tour, to write, and then to have children before it was too late. Once they arrived I stopped. I looked around. I watched the pot and noticed it was already boiling. 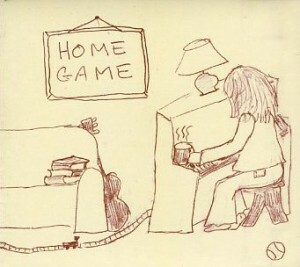 I like the double meaning of the album’s title, Home Game, which could apply to domestic life or sporting events. Was this planned or a happy accident? Last spring my younger son started to play baseball in the town rec league — Hoboken takes baseball very seriously — so I was hanging out at the dusty diamond and paying attention to the slow charms of baseball again. Which in the rec league are really slow! It seemed to fit with the slow charms of these years at home — both accident and design I guess. “A Sligo Lad” off the new album talks about a stormy Irish guy (from County Sligo) and mentions the town’s most famous son, William Butler Yeats. Is it true you have a cottage in Western Ireland? Sounds like a dream location for story songs. Describe life in and around the cottage. My husband’s family is from the West of Ireland and we built a cottage there some years ago. First of all, Irish weather really is wild — highly changeable and nearly unpredictable.. I’ve come to love it. And then there are the tides, which affect all aspects of life near the sea. Where we are, music is like farming or reading or drinking, or anything essential like that. In our little town there will be half a dozen pubs with music any night of the week. They clear out a corner of the pub and a few people come in with guitars and fiddles and bazoukis and concertinas and bodhrans and banjos and mandolas and bones and whistles and flutes — anywhere from two to twenty people, from six to eighty-six years old — and they play. There’s a profound etiquette about it all, you hardly ever see someone who shouldn’t be there. It’s mostly instrumental — whiskey is the key to enjoying hours of jigs and reels, I have found. Occasionally someone sings a song. The most magical thing is when someone who’s not in the session, somewhere in the pub, opens their mouth and starts singing. A cappella singing commands total silence and respect. I’ve done it myself. It’s wild. “A Sligo Lad” goes over big in the pubs. The song is about being a visitor, and getting hooked by the weather and mythology and romance of a place. Ireland has plenty of all that. And great stories, but I’m not sure I’d have the nerve to tell Irish stories. Steve Earle’s “Galway Girl” is very popular, but that’s like my song — an American getting mixed up in an Irish romance. You took time off from recording and touring while you concentrated on raising your two children. Did you miss the road and recording very much? I really miss the road. Being away, and playing a lot, and traveling with the band, and meeting so many strangers. I did a lot of touring before social technology bloomed so we were really disconnected. Trying to phone home from pay phones on the side of the highway with semis roaring by. And I love playing live. I hope to have a chance to do all that again before too long. Dave Schramm produced this album as well as 2004’s You Call That Dark. When did you two meet up and how has your work evolved over those seven years? I started working with Dave in 1992, so it’s more like eighteen years. He’s been a highly influential colleague. For one thing he is an absolute snob about music and though he’s kind and polite he’s dead serious about what he likes and doesn’t like, and I have great faith in his sensibility. Also I’m scared of him so I work harder at a song before showing it to him. His treatment of my songs is often transformative. Over the years he’s gone from being the guitar player (which is saying something) to being the producer — though the band works collaboratively in the studio. We’ve all played together for a long time. You launched Radio Free Song Club last year as a monthly podcast for veteran songwriters to air new material and talk about their work. The episodes I’ve listened to are intimate and really loose, very entertaining; Nicholas Hill (WFMU, WFUV, Sirius) is a wonderful host. Love Dave Schramm’s theme song, too. Where did the idea for this come from? I was trying to think of something to do with the internet. I knew there were people like me who were for whatever reasons not touring and recording as much as they used to, so I thought of having a place to post new songs every month. Nicholas suggested producing it like a live radio show and podcasting. It has turned into much more of a crazy live event than I first imagined. We have a great band every month and do about half the show live, often over-dubbing on files emailed in by club members. Once we recorded a song over Skype with half the band in Victoria William’s kitchen in Joshua Tree and half in New York. We hear you’re in a cover band called The Eve of Deconstruction. Really? We’d like to know more about this, please. My husband Tom named us. Very silly. Every show we do is all new covers, so we have to rehearse a lot. Which is kind of the point of the band because the rehearsals are really fun. There are six of us and everyone sings. We do Cole Porter and Fats Waller and Rodgers and Hart and Arthur Alexander and George Jones and the Kinks and the Ramones and Blondie and Dylan and Randy Newman and Joni Mitchell and Paul Westerberg and absolutely anything. The range of material has been good for all of us I think. I certainly learned a lot of new chords. The “Welcome Song” on your website includes the lines: “Let’s all enjoy this age of innocence!/This time of excess when we all think we’re friends!” How do you feel about the whole social media thing? It’s useful for musicians. A handy and free way to make music public. And it’s interesting, with the treasure trove of old songs and films that get circulated. It’s already getting stale though. And the whole “friends” thing is absurd and bizarre but wonderful too. Doesn’t seem like it will last, so we should enjoy the fun part of it all. You created the cover art for Home Game, and on the inside you quoted Sylvester Stallone lamenting the need to remain relevant. Was this a commentary on celebrity, or is this something every artist deals with? It just made me laugh, old Rocky worrying about relevance. Success is a weird measure of life. The idea of relevance is ridiculous. I thought it was kind of sweet too. Everyone has their own trip, that’s for sure. What do you look forward to (and/or dread) most about fronting a band and playing out again? I look forward to everything but dealing with band schedules. Being on stage with a nice microphone is a heady place. The songs are short and sweet and I have a wonderful band. And these songs haven’t been heard at all. It’s exciting and scary to do new songs. I recently read a NY Times article (http://www.nytimes.com/2011/01/07/arts/07kidrockers.html) about Kidrockers.com, where current bands (Silversun Pickups, Rhett Miller of Old 97s) play abbreviated, lower-volume matinee shows for fans and their small children, with the most recent show at the Living Room where you’re scheduled to play in February. Any plans to do one of these shows for your kid-toting fans? No! This whole scene of kiddie rock and rock camp and school of rock gives me the creeps. My songs are for grown-ups, anyway. Get a babysitter. Do you think you’ll record another “weird album” (your words) like What About Regret? Or another “weed” song like “Three Years in Nebraska”? That album is full of stories. “Three Years in Nebraska,” like “$55 Hotel” is basically a transcription with a hook. Pot farming and adultery are good topics. I’ve been reading Paul Zollo’s collection of interviews with songwriters. He’s interested in the idea that songs arrive from “beyond,” and the songwriter is just the conduit. I’m surprised how many writers feel that is true. It’s a completely foreign idea to me. What I sometimes get is a story that is so concise and tellable that all I have to do is write it down. I hope for more of those songs — I’m always listening. Kate was also kind enough to subject herself to ATF’s 12 Questions with . . .
We’re snowed in today so it’s whatever is in the house. Which isn’t much, I’m afraid. Some stale Christmas cookies. My neighbor makes obscure and intriguing mixtapes for Christmas so I’m listening to this year’s edition. He’s a genius at finding good bands. Also my family got interested in Anthony Tommasini’s gimmick for the NY Times of choosing the Top Ten classical composers of all time. He said one of the Viennese had to go: Haydn, Mozart, Beethoven or Schubert. Figuring Mozart and Beethoven are shoe-ins, we decided to listen to a lot of Haydn and Schubert and make a choice. I’ve been assigned Schubert. He would fit right into my neighbor’s mixtapes. I’m also listening to roughs of the Radio Free Song Club. There are some good shows coming soon. Is babysitting a job? I’ve had so many weird little jobs. Maybe the first paycheck job was at Dockside Sales in Alexandria, Virginia. It was a big warehouse import store that sold everything from food to furniture. It was old and creaky and smelled wonderful and I loved running the big heavy Sweda cash register. I was a dancer. And then an actress. And then a singer. I never had a very practical view of life. I had lots of day jobs though. 8. What record or artist changed your life when you first heard it, him or her? Loretta Lynn’s Greatest Hits on a cassette tape in 1980 started me writing songs. She’s so plain-spoken and the music is simple and the feelings are strong and not sentimental. Somehow she gave me the idea I could do that. Prose. (Poetry in small doses, and more so as I get older.) Dickens? Updike? Thomas Mann? Virginia Woolf? Turgenev? Too hard! 10. What does Hoboken mean to you? 11. If you were inducted into the Rock ‘n’ Roll Hall of Fame tomorrow, what would be the first sentence of your acceptance speech? Can I have a Grammy question instead? 12. What’s next for Kate Jacobs? I have to write a song for next week’s Radio Free Song Club. I started it on New Year’s Day, in a melancholy New Year’s mood. I have to find the right melancholy melody.